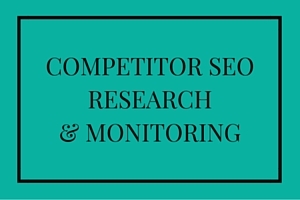 Monitor your competitors’ online SEO performance, before they start monitoring yours. All you have to do is let me know your chosen ‘keywords’ (or terms). You can have up to 100 of them! If you need help with this, I can advise on what sort of search terms might be best for your business. There’s more… whatever keywords you give me, I can run weekly reports on up to three of your competitors’ websites too, for those same search terms. Competitor SEO analysis enables you to plan ongoing digital content to outrank them for the keywords you are both after! …and so on, and so forth. With up to 100 terms to choose from you can really start thinking about what search terms you would like your website to be found for. Remember to think about what keywords your competitors might be targeting too, as you keep an eye on those as well. Aside from simply seeing how many positions up or down your website is moving for each of your chosen terms on a weekly basis, this knowledge can give you real power. Through straightforward competitor SEO analysis you can see if one of their keywords is climbing higher up the search listings each week. If it is, you will be able to publish some fresh content to give your own website an extra push. On the flipside, if you see your competitors’ struggling to maintain their SEO ranking for a key term, you might decide to focus on that term instead (or as well). One of the ways you can try and ‘steal’ a competitors’ higher spot for a keyword is by writing fresh news or blog content. You can either do yourself or can ask me to help. There are plenty of other ways too, which I can suggest to you at the end of each month if you opt to receive a bespoke monthly report. To find out even more and to see a list of rates for this service, click to read about SEO reporting and keyword tracking.